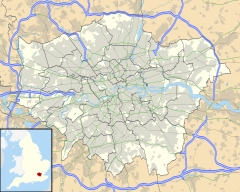 Islington (/ˈɪzlɪŋtən/) is a district in Greater London, England, and part of the London Borough of Islington. 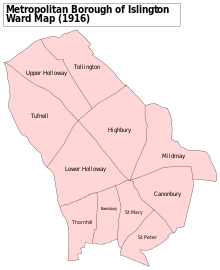 It is a mainly residential district of Inner London, extending from Islington's High Street to Highbury Fields, encompassing the area around the busy High Street, Upper Street, Essex Road (former "Lower Street"), and Southgate Road to the east. The Angel business improvement district (BID), an area centered around the Angel tube station, exists within southern Islington district and northern portions of two other districts in the London Borough of Islington – Finsbury and Pentonville. The first recorded church, St Mary's, was erected in the twelfth century and was replaced in the fifteenth century. Islington lay on the estates of the Bishop of London and the Dean and Chapter of St Pauls. There were substantial medieval moated manor houses in the area, principally at Canonbury and Highbury. In 1548, there were 440 communicants listed and the rural atmosphere, with access to the City and Westminster, made it a popular residence for the rich and eminent. The local inns harboured many fugitives and sheltered recusants. The Regent's Canal passes through Islington, for much of which in an 886-metre (2,907 ft) tunnel that runs from Colebrook Row east of the Angel, to emerge at Muriel Street near Caledonian Road. The stretch is marked above with a series of pavement plaques so walkers may find their way from one entrance to the other. The area of the canal east of the tunnel and north of the City Road was once dominated by much warehousing and industry surrounding the large City Road Basin and Wenlock Basin. Those old buildings that survive here are now largely residential or small creative work units. This stretch has an old double-fronted pub The Narrowboat, one side accessed from the towpath. 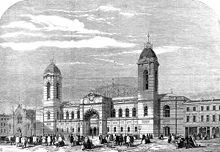 The African National Congress's headquarters in-exile was based on Penton Street. It was the target of a bomb attack in 1982. Islington High Street is the former High Street of the original village of Islington. High Street runs approximately 500 metres (0.31 mi) from the intersection of Pentonville Road and City Road at the south end to Islington Green at the north end, where it branches into Upper Street and Essex Road (former Lower Street) – though some maps may simply show High Street as the southern portion of Upper Street. The earliest reference to Islington High Street is its appearance on a 1590 map of the area. At this time, nine inns (including the famous Angel, which has subsequently given its name to the area around High Street), as well as housing and a public pond were shown lining the street. Then as now, Islington was and is unusual in that the village church, St Mary's, does not stand on the high street but is some way off on Upper Street. Douglas Adams lived in Arlington Avenue. The phone number of his house was 226 7709. In The Hitchhiker's Guide to the Galaxy when Arthur Dent and Ford Prefect are rescued in ZZ9 Plural Z Alpha, the probability of that happening was 2 to the power of 267,709 to one against. Douglas also used Islington as a setting in his novels, and named a character in his famous Hitchhikers' Guide to the Galaxy (1978) series, Hotblack Desiato, after a well-known local estate agent. Islington was also the place in which Arthur Dent meets Trillian during a party in a flat. In Adams' Dirk Gently series, Dirk's Holistic Detective Agency, Richard MacDuff's flat, and Susan Way's flat are all in Islington (though Dirk's office is on a fictional street). Emma Evans, protagonist of Margaret Drabble's novel The Garrick Year (1964), lives, after she has married her husband David, in "an ordinary nineteenth-century terrace house in Islington, and on either side of the front door stood a small stone lion ... the back garden was up to the standard of the lions". In Neil Gaiman's best-selling novel Neverwhere, Islington is a fallen angel that lives under London, named after the Angel tube station. Im The Diary of a Nobody (first serialized in Punch magazine in 1888–89 and first printed in book form, in 1892), an English comic novel written by George Grossmith and his brother Weedon Grossmith, the main character lives off the Holloway Road in Brickfield Terrace. Nick Hornby's novels About a Boy and Slam are set in Islington. The area contains numerous Georgian townhouses, shops and pubs. Many whole terraces are listed including much of Liverpool Road (one side of which is in Barnsbury) and Islington High Street/Upper Street. Other multiply listed streets include Arlington Square (one of the UK's top 10 garden squares) Camden Passage, Compton Terrace, Colebrooke Row, Cross Street, Duncan Terrace, Essex Road, Gibson Square and Milner Square. Mecca Bingo Hall (now close, once the Carlton Cinema, Essex Road). This is due to become a church in the near future. ^ John Richardson, Islington Past, Revised Edition, Historical Publications Limited, 2000;pp 59–60. ^ Happold, Tom and Maguire, Kevin. "Revealed: Brown and Blair's pact", The Guardian, 6 June 2003. Retrieved 25 December 2005. ^ Croot, Patricia (1985). "Islington Growth". A History of the County of Middlesex. British History Online. 8: 9–19. Retrieved 11 May 2007. ^ Croot, Patricia (1985). "Islington Communications". A History of the County of Middlesex. British History Online. 8: 3–8. Retrieved 11 May 2007. ^ "Peacock Inn, Islington". londonremembers.com. ^ "Places of Note". London Borough of Islington. Archived from the original on 20 April 2010. Retrieved 11 May 2007. ^ "London Underground Statistics". Tube Prune. 21 April 2003. Retrieved 11 May 2007. ^ "Tube Ski Stunt Blasted by Police". BBC. 28 March 2007. Retrieved 12 May 2007. ^ Higson, Charlie (2010). The Dead. p. 6 of 6, Chapter 25. 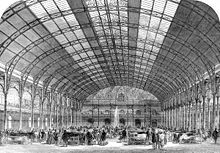 ^ "In the spotlight: the London Borough of Islington". Gay Star News. 7 July 2015. Retrieved 22 May 2017. ^ "London Head Office Archived 19 April 2009 at the Wayback Machine." Civil Aviation Authority. Retrieved 9 September 2010. ^ "Nation's 10 Popular Parks". ^ Islington Gazette (9 July 2008). "Bingo hall gets all-clear to become church". Retrieved 17 July 2008. This page was last edited on 9 March 2019, at 14:02 (UTC).